All patrons with a valid Library borrower's card (this may be your student or staff card) are entitled to borrow materials from the Tin Ka Ping Education Library. Find out more about your borrowing privileges and other information on circulation services. Library staff on duty at the Information Counter will help answer general questions about the use of the Library. Enquiries can also be made by phone (3917-2205), e-mail (edulib@hku.hk) or fax (2857-9625). The Research Consultation Service is a personal research consultation service offered by the Education Librarian. The Librarian advises patrons on how to effectively gather research material pertaining to their research projects. Library orientation programmes are organised for new students of the Faculty of Education at the beginning of each academic year. Individual or group orientations and training on database and reference software may also be scheduled on request. Click here for more details. A self-service colour printer and two photocopiers are available at the Library and are operated with Octopus cards. Wireless printing is also supported by one of the photocopiers. Click here for more information about the Libraries’ photocopying and printing service. For scanning, a scanner is available at the computer workstation area, and is connected to a PC installed with Adobe Photoshop. Six discussion rooms equipped with smartboards or webcam/TV display panels are available for booking by staff and students for small group discussions, group viewing or small group demonstrations. Reservation can be made online or in person at the Information Counter. 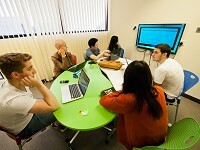 The Tin Ka Ping Education Library offers four PCs and two iMacs with Internet connection and software applications in support of study and research. Laptops and tablets are available for short loan at the Information Counter for use anywhere on campus. Find out more about this service. The entire Library is covered by wireless hotspots facilitating patrons in accessing the Internet with their own wireless devices. Click here for configuration procedures. The multimedia viewing area is furnished with a DVD player, a TV display and comfortable seating. Patrons can enjoy our rich multimedia collection during library opening hours. The roof garden is an open air garden space promoting informal exchanges, impromptu meetings, meditation, and relaxation. A book drop is located at the lift lobby on the 8th Floor, Meng Wah Complex for patrons to return library materials outside of library opening hours. Find out more about the Libraries’ book drop service.